Cyril Tulk was born in Montreal, Quebec, Canada in 1934. When he was around five years old, his parents moved to Toronto, Ontario, Canada. 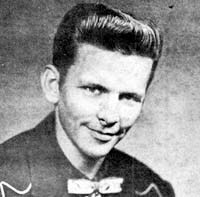 During his teen years, he was said to have been bitten by the country music bug and found inspiration with the music of Hank Williams. When he was seventeen, he started entertaining folks and by 20, had turned 'professional'. He married the former Gil Butchart. A 1965 story indicated they had a daughter named Sharon Diane. His introduction to radio and music was not by accident. His parents owned and operated radio station CKMP in Midland, Ontario. He had his own show and did some announcing as well. He later joined CKFH as an engineer while trying to promote his musical endeavors. In 1961, he went to Nashville, Tennessee and recorded a few sides for the Quality label in Canada. In 1964, he signed with the RIC label that was based in Nashville. The RIC recordings were also released on the Quality label in Canada. While we have not been able to document the Quality recordings yet, one article mentions the sides cut were: "I'm Not The Kind" b/w " Four More Stairs" and "Slap The Horse And Hang The Man" b/w "Better To Be Loved". The RIC recording "My Good Life" was co-written by Cy with his friend and manager, Art Locke. As his popularity grew, he found himself in demand. He made several appearances on the Canadian Television network weekly show, "Country Music Hall" that was hosted by Carl Smith. Carl's show would feature the 'up and coming acts' on the Canadian scene at the time such as Cy, Buster Brown, Iwin Prescott, Ron McLeaod and Sharon Strong. The mid-1960s also saw Country Music gain popularity in major markets as radio stations switched their formats. One such metropolitan area was Toronto which saw CFGM switch to a country music format. Their on the air staff included Cy Anders who had a Saturday afternoon show at 1:00pm for a time. CFGM's listeners joined by the thousands the station's 'club' and had over 55,000 card carrying members at one time. The Horseshoe Tavern in Toronto was becoming a hot bed for visiting country music acts as well. We heard from Nick Tanquiy who worked as a technician at CFGM in 1962. He notes the station was located in Richmond Hill, Ontario. He notes he has an air check recording of Cy's "I'm Not That Kind" and indicated it was a great song and wants to find a better version of it. Later in 1965, CFGM brought the Johnny Cash show to Toronto. The show included June Carter, Tex Ritter, David Houston, Tillman Franks and the Statler Brothers. The shows also included Canadian artists Sandy Selsie, Ross Allen and Cy Anders. Cy's band / group included Roy Penney, Tommy St. dennis, Sandy Selsie and Bill Gibbs. The 1960s brought about a different type of setting for country music artists. Doing live shows on the radio was an era that had slipped away. Disc Jockey shows were prevalent. But those who were heard on the air, would still do personal appearances in their listening audience area. Cy was no different. A 1966 article mentions he was working in Peterboro, Ontario and Timins, Ontario and also had a two week engagement in Brmpaton, Ontario. Mention was made of the hassle traveling between Peterboro and Timmins due to heavy snow. In another article in 1967, we found he had finished a two month stint at the Diplomat Tavern in Toronto. Then was to appear in Peterborough from November 28 to December 17m 1967. In 1968, he was to work for two weeks starting January 9 at the new Rivalda Restaurant in Toronto. That same 1967 article also included news of his fan club. Its president was Joyce Leggatt. The Vice-President was her sister, Carol Hrappstead (nee Leggatt); the article mentions she died in a car accident in Manitoba in October 1967. Hillbilly-Music.com wishes to thank Nick Tanquiy for contacting us and providing some information about Cy Anders and CFGM.